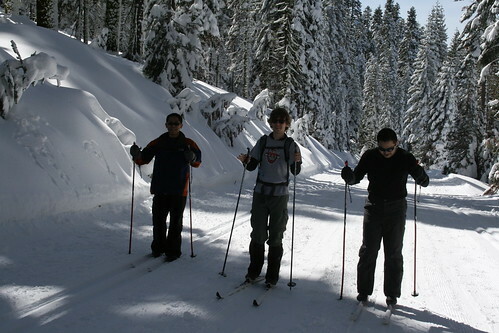 Romy's lab-mate at Berkeley, Ricky, who is now done with his PhD and is soon leaving the lab, has never been skiing before, so Romy thought it would be fun to go take him skiing. Deciding that cross country would be easier and cheaper than downhill, we opted for cross-country. 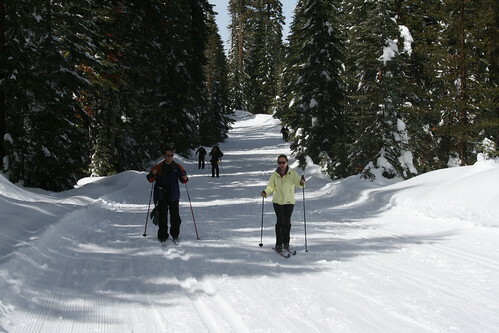 The most convenient place to go was Yosemite to the Badger Pass ski area. 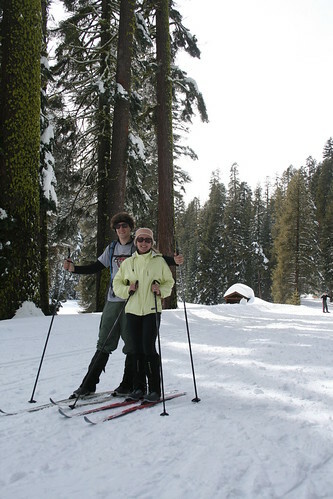 In winter the road to Glacier Point in the park is closed, and the park grooms the snow-covered road for cross country skiing and snowshoeing. They also rent cross country skis for those people who don't have their own set. Ricky brought one of his room mates with him, so all four of us crammed ourselves in the Daewoo and headed to the mountains on Sunday early in the morning. Yosemite Valley in the morning, covered in snow. 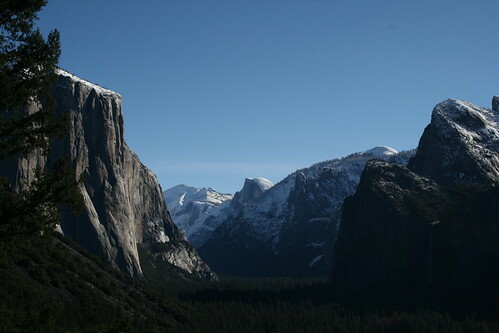 When we got there, Yosemite was covered in deep snow! Even half dome had snow on top of it! We grabbed a quick breakfast in Yosemite Village at the cafe, and more coffee, and then got back into the car and headed up to Badger Pass. It was really warm outside, about 50 degrees, and the sky was clear and blue and sunny! When we got to Badger Pass turn-off, a ranger told us we needed to put chains on, so after struggling with trying to untwist the twisted chain for the left tire, we finally got back on the road. The road wasn't horrible, but half of it was covered with some icy and snowy patches. When we got to the resort, Ricky and his room mate went to the rental shop to get their skis, and Romy and I unpacked our skis from the car. We then hit the trail, which started with a small hill. It probably scared Ricky and his room mate, both who never skied before, but I guess you have to start somehow. They slowly got the hang of it as we skied on, although they had their fare share of falling down. 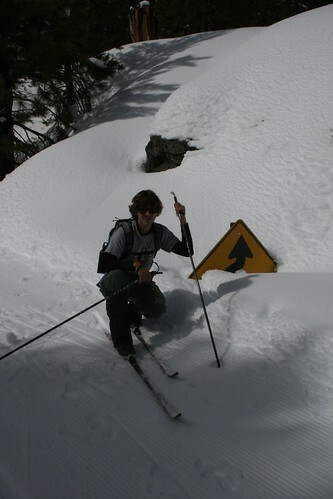 I didn't realize at first that we were skiing on Glacier Point Rd until I saw some of the road signs, almost completely covered with snow! It was really really deep! At the end of the road, which is about 10 miles from the Badger Pass ski area, there is a ski hut which cross country skiers could stay at overnight. You have to make reservations for the hut in advance. Maybe one day we will do that. You have to carry a backpack with you while you ski, because it is a rustic bunkhouse. I also heard about a nordic 18K race that goes on every February. I think I want to do the race next year! It looks like a lot of fun. Romy next to a snow covered road sign.